It is fair to say that, right now, there are plenty of things in the world to get hot under the collar about. Anyone who doesn’t live in a cave will be concerned by all manner of burning issues: the seemingly growing number of unstable world leaders, the unfolding tragedy of famine in Africa and the Middle East, the continuing horrors of Aleppo, not to mention the fact that the spectre of terrorism still looms large. 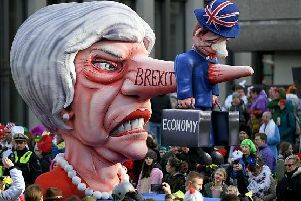 Then we have the really pressing matters at home which include a large chunk of a nation watching in horror as a band of swivel-eyed loons (a phrase coined by an aide of a former Prime Minister remember) merrily march us toward the brink of exiting the EU. This is now likely to be made even more complicated by Scottish nationalists’ demands for a second ‘once in a lifetime’ independence referendum in three years. If 2016 was the current affairs’ equivalent of an LSD-induced trip for news junkies everywhere then 2017 is the painful comedown, when the consequences of a 12 months which will live long in the memory are now being slowly digested. One of the architects of our current woes, former Chancellor George Osborne, caused the blood pressure of millions to crank up a notch when he acquired his sixth job - the editorship of the London Evening Standard - even though he is as qualified for that role as I am for the position of Mother Superior. With all this going on everything else must pale into insignificance right? Wrong. Last week a small, but very vocal, number got their collective knickers in a twist when a 73-year-old politician referred to his female staff as ‘the girls’. Sir Roger Gale, Britain’s third most famous Sir Roger after Bannister and Moore, used the term several times, during an otherwise forgettable radio interview. I listened to the BBC broadcast, while stuffing packed lunchboxes and mopping up Weetabix residue, and I can honestly say that my sensibilities weren’t troubled once. But the interview did cause temperatures elsewhere to rise, prompting accusations of sexism to be levelled against Sir Roger. Rather than die an immediate death, the ‘story’ lived for well over 24 hours, with the Today Programme returning to the issue, this time by way of a head-to-head between one of the ‘girls’, a 40-something by the name of Debi, and an affronted academic. Poor Debi, clearly all she wanted from her Friday morning was to be opening letters from her boss’s constituents about dog dirt and bus timetables, but instead she was forced to defend the Tory’s description of her and her colleagues. She was clearly bewildered by the fuss, after all she quite likes being referred to as a girl and pointed out that Sir Roger was a good boss who occasionally gets the buns in. But this was too much for the female prof, who argued that the use of such a term was “demeaning”. When it was pointed out that many talk about having a ‘girls’ weekend’ or even a ‘night out of the lads’ she dismissed this argument out of hand. I honestly wasn’t fussed about this row until I listened to this pointless piece of radio, then I got cross because I had been forced to give a monkey’s. How consenting adults refer to one another really is nobody’s business other than their own. Some people really don’t have enough to worry about.